Ph.D., 1998, State University of New York at Stony Brook. New York, USA. M.S., 1988, Chinese Academy of Meteorological Sciences. Beijing, China. B.S., 1985, Nanjing Institute of Meteorology, Nanjing, China. 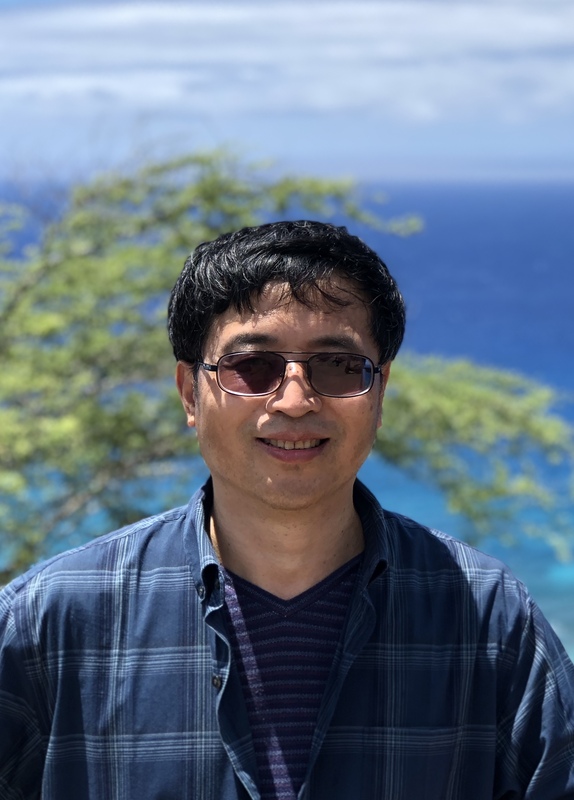 My research interests include climate model development and validation, cloud and convection parameterization developments, and objective data analysis. I work with the DOE Energy Exascale Earth System Model (E3SM) and the NSF/DOE Community Atmospheric Model (CAM). I use a hierarchy process modeling approach, including single-column model (SCM), cloud-resolving model (CRM), and the Cloud-Associated Parameterizations Testbed (CAPT), to test existing and new parameterizations with both field data and satellite observations. As a co-Chair for the E3SM Atmospheric Group, I co-led the development of the first generation of E3SM Atmosphere Model (EAMv1). I am currently leading the development of atmospheric physics for the next generation of E3SM. Specific emphasis is to integrate and assess various improvements in atmospheric chemistry, aerosol, clouds, and convection in E3SM. My research associated with CAPT, which utilizes the short-range weather forecast technique in diagnosing climate model errors, is to systematically explore the correspondence between short- and long-timescale systematic errors in current climate models and clarify over what timescales model systematic errors develop. The goal is to provide essential clue to the origins of these errors. My research on parameterization developments is mainly focused on convective trigger/closure for deep convection. Specifically, I would like to understand what physical processes and large-scale dynamic and thermodynamic control of cumulus convection and how these processes can be appropriately parameterized in climate models. Currently I emphasize on improving the diurnal cycle of model precipitation, particularly the nocturnal elevated convection over lands, through improving convective triggering mechanisms. I am leading a Global Atmospheric System Studies (GASS) project on modeling diurnal and semi-diurnal cycle of precipitation in different climate regimes. For the field data analysis, the goal is to develop necessary data products with advanced data analysis methods and quantify their uncertainty in support of cloud modeling study and climate model development. I have been heavily involved in the DOE Atmospheric Radiation Measurement (ARM) program since 1998. One of my responsibilities is to transform the detailed ARM observations into a form that can be easily used by the climate modeling community. Some widely used data products from my ARM science infrastructure group include the ARM best estimate dataset (ARMBE) and the variational analysis derived large-scale forcing data for SCM/CRM/LES studies. We also develop tools to promote ARM data particularly to the climate modeling community, which includes the ongoing effort to develop an ARM radar simulator and an ARM-oriented process diagnostics package for GCMs. We also explore the machine learning approach to help identify data quality issues with ARM observations. Before I came to the United States, I had worked for 5 years at the National Meteorological Center of China. My research was in the development of numerical weather forecast model for medium-range weather forecasts, which included the development of numerical methods for calculating large-scale advection terms and testing various parameterizations of cumulus convection. Jun 2001- Present: Research Scientist, Lawrence Livermore National Laboratory (LLNL), Livermore, CA. Oct 1998 - May 2001: Post-doctoral researcher, Lawrence Livermore National Laboratory, Livermore, CA. Aug 1993 - Oct 1998: Research Assistant, Inst. of Terrestrial and Planetary Atmosphere, SUNY at Stony Brook. Stony Brook, New York. Jul 1988 - Aug. 1993: Research scientist/Senior Research Scientist, Numerical Weather Prediction Division, National Meteorological Center, Beijing, China. Deputy group leader for the Medium-range Weather Forecast Modeling Group, National Meteorological Center, China (1992-1993). LLNL PI for two DOE funded Earth System Modeling Projects on improving cumulus convection for E3SM. (2018-2021). Technical Leader for developing the second generation of the Chinese medium-range weather forecast model (1992-1993). Major developer/played leading role in developing the second generation of Chinese medium-range weather forecast model (1993). The work received the first place award of the Chinese Meteorological Administration (CMA) Science and Technology Award in 1994, the most prestigious award in CMA. Developed a new convective triggering mechanism which was used in the operational weather prediction model of the Japanese Meteorological Agency (JMA) to improve its precipitation forecast in 2008. Relevant studies were highlighted in both “Our Changing Planet - The U.S. Climate Change Science Program for Fiscal Year 2006” and the “DOE ARM Notable Research Findings for the Past Five Years”. Project leader for the ARM modeling data and tools developments. These include the ARM Best Estimate data, the large-scale forcing data, and ARM process-oriented diagnostic package and ARM cloud radar simulator for climate model evaluation and development. The research on developing continuous large-scale forcing datasets for SCMs/CRMs was highlighted in the “DOE ARM Notable Research Finds for the Past Five Years”. The ARM Best Estimate (ARMBE) dataset was highlighted by the 2010 DOE BER Advisory Committee (BERAC) review for the ARM program. The idea of creating ARMBE-like dataset is being adopted by several field programs in US and European. Built an SCM based on the NCAR CCM3. DOE Energy Exascale Earth System Model (E3SM) Award for “Leadership and dedication to the Phase E3SM project as Phase 1 Atmosphere Group Leaders”, DOE, 2018. Physical and Life Sciences Directorate Award for Excellence in Publication “For improving our understanding of the role of clouds, radiation, and precipitation processes in contributing to surface temperature biases”, LLNL, 2018. Physical and Life Sciences Directorate Mentor Award for “Outstanding Mentorship of Postdoctoral Staff”, Lawrence Livermore National Laboratory, 2016. Energy and Environment Directorate Program Award for “developing a new convective triggering function for NCAR CAM2 to improve the predicted precipitation over land”, Lawrence Livermore National Laboratory, 2004. Chinese Meteorological Administration (CMA) Science and Technology Award (1st place) for “developing the second generation of Chinese medium-range weather forecast model”, CMA, China, 1994. This is a team award. Beijing Meteorological Society Young Scientist Best Science Paper Award (3rd place) for the paper “A new positive definite advection scheme and its application to the moisture equation”, 1992. Chinese National Meteorological Center Young Scientist Award (1st place) for “developing a new positive definite advection scheme and its implementation in removing negative moisture in the Beijing Limited-Area Model”, National Meteorological Center, 1988. Co-Chair for the US ARM-EU Collaboration Working Group in identifying and sharing initial and evaluation datasets for Large Eddy Simulations (LES) and Global Climate Models (GCMs) (2013). Chair for the DOE ASR “Quantification of Uncertainty in Cloud Retrievals (QUICR)” Focus Group (2011 - 2015). Member of the DOE ARM Data Reprocessing Advisory Committee (2011 – 2014). Member of review panels for the DOE Regional and Global Climate Modeling program and Atmospheric System Research program, and NASA Data for Operation and Assessment program. Member of review panels for LLNL Physical & Life Science Directorate LDRD program (2015, 2016). Member of Lawrence Fellowship Research Committee (2007). Proposal reviews for DOE and NSF programs. Member of Ph. D Student Dissertation Committees, School of Marine and Atmospheric Sciences (SoMAS), Stony Brook University, 2013-2015. Led the analysis of the joint GCSS/ARM cloud modeling working group’s multi-model intercomparison Case 3 - a summertime midlatitude continental convection case, and case 4 - a springtime deep frontal case studies. Journal article reviews (> 100) for Journal of Geophysical Research, Geophysical Research Letter, Journal of Climate, Monthly Weather Review, Climate Dynamics, Journal of Atmospheric Science, Quarterly Journal of the Royal Meteorological Society, Meteorology and Atmospheric Physics, International Journal of Climatology, Atmospheric Research, Journal of the Meteorological Society of Japan, Terr. Atmos. Ocean. Sci. Journal, and The Open Atmospheric Science Journal. “The E3SM Next Generation Development of Atmospheric Physics”, Invited speaker, the DOE ARM/ASR annual PI meeting, June 10-13, 2019, Maryland, US. Xie, S. 2018: “Toward Bridging Field Observations and Climate Model Developments: The U. S. DOE Modeling Testbeds”, Invited Seminar, University of Arizona. Oct. 2018, Tucson, AZ. Xie, S. 2018: “The Cloud-Associated Parameterizations Testbed (CAPT) – Diagnosing Climate Model Errors with Weather Forecast Technique”, ZiJing Forum, Tsinghua University. May 2018, Beijing, China. Xie, S. 2017: “Update on the U.S. DOE ACME Model Development and Its Plan for CMIP6”, invited speaker, the US-China Climate Model Intercomparison workshop. Aug 23-25, 2017, Beijing, China. Xie, S. et al. 2017: “Recent progress on the US DOE high-resolution climate model development”, Invited speaker, the 2016 CCLiCS Workshop on Earth System Modeling, Oct. 25-28, 2016, Taipei, Taiwan. Xie. S. et al., 2016: Bridging the Gap between GCM Clouds and Detailed Ground-Based Cloud Observations – the ARM Cloud Radar Simulator, AOGS, Jul. 31 – Aug. 5, 2016, Beijing, China. Xie. S. et al., 2016: Diagnosis of Climate Model Errors in Simulating Surface Temperature over Central United States, AOGS, Jul. 31 – Aug. 5, 2016, Beijing, China. Xie, S. et al, 2015: Clouds and Precipitation Simulated by the US DOE ACME. Invited speaker, AOGS, Aug. 2-7, 2015, Singapore. Collins. W., I., Kraucunas, and S. Xie, 2014: Climate Science. Presenter, National Lab Day on Capital Hill, Sept. 16, 2014, Washington D.C, USA. Xie, S. et al., 2014: Understanding Climate Model Errors using the Weather Forecast Technique with Field Data. Invited speaker, AOGS, July 28 – Aug. Sapporo, Japan. Xie, S. et al., 2014: The DOE ARM/ASR Effort in Quantifying Uncertainty in Ground-Based Cloud Property Retrievals. Invited speaker, AOGS, July 28 – Aug. Sapporo, Japan. Xie, S. and J. Mather, 2013: The DOE ARM Program and Its Role in Climate Research. Invited speaker, The Next Generation Climate Data Products Workshop, 14-19 July 2013, Boulder, CO, USA. Xie, S., A. Protat, and C. Zhao, 2013: The US-DOE ARM/ASR Effort in Quantifying Uncertainty in Ground-Based Cloud Property Retrievals. Invited speaker, AGU fall meeting, Dec. 9-13, 2013, San Francisco, CA, USA. Xie, S., et al., 2013: Overview of the ASR QUICR Activities. Plenary talk, 2013 ASR Science Team Meeting, Mar. 18-21, 2013, Washington D. C., USA. Xie S. et al., 2012: On the Correspondence between Short- and Long- Timescale Systematic Errors in Transpose-AMIP models. Plenary talk, 1st pan-GASS meeting, September 10-14, 2012, Boulder, CO, USA. Xie. S. et al., 2012: Understanding Climate Model Parameterization Errors in Forecasts Using Field Data. Invited speaker, AOGS-AGU (WPGM) Joint Assembly, Aug. 13-17, 2012, Singapore. Xie S. et al., 2012: Correspondence between Forecast Errors and Climate Errors in Transpose-AMIP and CMIP5 Models. Invited speaker, AOGS-AGU (WPGM) Joint Assembly, Aug. 13-17, 2012, Singapore. Xie, S. et al., 2011: Development of the Large-Scale Forcing Data to Support MC3E Cloud Modeling Studies. Invited speaker, AGU fall meeting, Dec. 5-9, 2011, San Francisco, CA, USA. Xie, S., 2011: Transform Detailed ARM Observations into An Useful Climate Modeling dataset. Invited Speaker, DOE ARM Data Developer Meeting. July 16 – 17, 2011, Oak Ridge, TN, USA. Xie, S. et al. (2019): Improved Diurnal Cycle of Precipitation in E3SM with a Revised Convective Triggering Function. JAMES, Submitted. Xie, S., Lin, W., Rasch, P. J., Ma, P.‐L., Neale, R., Larson, V. E., et al. (2018). Understanding cloud and convective characteristics in version 1 of the E3SM atmosphere model. Journal of Advances in Modeling Earth Systems, 10, 2618–2644. https://doi.org/10.1029/2018MS001350. Xie, S., Y. Zhang, S. E. Giangrande, M. P. Jensen, R. McCoy, and M. Zhang, 2014: Interactions between Cumulus Convection and Its Environment as Revealed by the MC3E Sounding Array. J. Geophys. Res. Atmos., 119, 11784–11808, doi: 10.1002/2014JD022011. Xie, S., X. Liu, C. Zhao, and Y. Zhang, 2013: Sensitivity of CAM5 Simulated Arctic Clouds and Radiation to Ice Nucleation, J. Clim. 26, 5981-5999, DOI: 10.1175/JCLI-D-12-00517.1. Xie, S., H. Ma, J. Boyle, S. Klein, and Y. Zhang, 2012: On the Correspondence between Short- and Long- Timescale Systematic Errors in CAM4/CAM5 for the Years of Tropical Convection. J. Clim. 25, 7937–7955. doi: 10.1175/JCLI-D-12-00134.1. Xie, S., and 16-coauthors, 2010: ARM climate modeling best estimate data, Bull. Amer. Meteor. Soc, 91, 13–20 , doi:10.1175/2009BAMS2891.1 . Xie, S., T. Hume, C. Jakob, S. Klein, R. McCoy, and M. Zhang, 2010: Observed large-scale structures and diabatic heating and drying profiles during TWP-ICE, J. Climate, 23, 57-79, doi:10.1175/2009JCLI3071.1< . Xie, S., J. Boyle, S. A. Klein, X. Liu and S. Ghan, 2008: Simulations of Arctic Mixed-Phase Clouds in Forecasts with CAM3 and AM2 for M-PACE, Journal of Geophysical Research, 113, D04211, doi:10.1029/2007JD009225 . Xie, S., S. Klein, M. Zhang, J. Yio, R. Cederall, and R. McCoy, 2006: Developing large-scale forcing data for single-column and cloud-resolving models from the Mixed-Phase Arctic Cloud Experiment. J. Geophys. Res., 111, D19104, doi:10.1029/2005JD006950 . Xie, S., et al., 2006: An assessment of ECMWF analyses and model forecasts over the North Slope of Alaska using observations from the ARM Mixed-Phase Arctic Cloud Experiment. J. Geophys. Res., 111, D05107, doi:10.1029/2005JD006509 . Xie, S., M. H. Zhang, J. S. Boyle, R. T. Cederwall, G. L. Potter, and W. Y. Lin, 2004: Impact of a revised convective triggering mechanism on CAM2 model simulations: results from short-range weather forecasts. J. Geophys. Res. 109, D14102, doi:10.1029/2004JD004692. Xie, S., R. T. Cederwall, M. H. Zhang, and J. J. Yio, 2003: Comparison of SCM and CSRM Forcing Data Derived from the ECMWF Model and From Objective Analysis at the ARM SGP Site. J. Geophys. Res., 108 (D16), 4499, doi:10.1029/2003JD003541. Xie, S. C., 1991: A New Positive Definite Advection Scheme and its Application to the Moisture Equation. ACTA METEOROLOGICA SINICA, Vol.49, 11-20. Rasch, P. J., S. Xie, P. Ma, W. Lin, et al. (2019): An Overview of the Atmospheric Component of the Energy Exascale Earth System Model. JAMES, submitted. Tao, C., Y. Zhang, S. Tang, Q. Tang, H. Ma, S. Xie, and M. Zhang, 2019: Regional moisture budget and land-atmosphere coupling over the US Sothern Great Plains inferred from the ARM long-term observations. JGR, Submitted. Zhang, M., X. Liu, et al. (including S. Xie), 2019: Impacts of Subgrid Mixing between Cloud Liquid and Ice on Arctic Mixed-Phase Clouds with NCAR CAM5. JGR, submitted. Golaz, J. C. et al. (including S. Xie) (2019): The DOE E3SM Coupled Model Version 1: Overview and Evaluation at Standard Resolution, JAMES, https://doi.org/10.1029/2018MS001603. Tang, S., Xie, S., Zhang, M., Tang, Q., Zhang, Y., Klein, S. A., et al (2019). Differences in Eddy‐Correlation and Energy‐Balance Surface Turbulent Heat Flux Measurements and Their Impacts on the Large‐scale Forcing Fields at the ARM SGP Site. Journal of Geophysical Research: Atmospheres, 124. https://doi.org/10.1029/2018JD029689. Tang, Q., S. A. Klein, S. Xie, W. Lin, et al. (2019). Regionally refined capability in E3SM Atmosphere Model Version 1 (EAMv1) and applications for high-resolution modelling. Geosci. Model Dev. Discuss., https://doi.org/10.5194/gmd-2019-11. Jiang, T., Evans, K., Branstetter, M., et al. (including S. Xie) (2019). Northern Hemisphere blocking in ∼25‐km‐resolution E3SM v0.3 atmosphere‐land simulations. Journal of Geophysical Research: Atmospheres, 124. https://doi.org/10.1029/2018JD028892. Qian, Y., and coauthors including S. Xie, 2018: Parametric Sensitivity and Uncertainty Quantification in the Version 1 of E3SM Atmosphere Model Based on Short Perturbed Parameter Ensemble Simulations. J. Geophys. Res. Atmos., https://doi.org/10.1029/2018JD028927. Zhang, T., Zhang, M., Lin, W., Lin, Y., Xue, W., Yu, H., He, J., Xin, X., Ma, H.-Y., Xie, S., and Zheng, W. 2018: Automatic tuning of the Community Atmospheric Model (CAM5) by using short-term hindcasts with an improved downhill simplex optimization method, Geosci. Model Dev., 11, 5189-5201, https://doi.org/10.5194/gmd-11-5189-2018. Ma, H., C. Zhou, Y. Zhang, S. A. Klein, M. D. Zelinka, X. Zheng, S. Xie, W.-T. Chen, and C.-M. Wu, 2018: Insights into climate model moist processes errors from a multi-year ensemble of short-range hindcasts, to be re-submitted. Zhang, Y. S. Xie, et al. 2018: Evaluation of Clouds in EAMv1 with Satellite and Ground-based Simulators. JGR, submitted. Tang, Q., S. Xie, Y. Zhang, T. Phillips, J. Santanello, D. Cook, L. Riihimaki, and K. Gaustad, 2018: Heterogeneity in Warm-Season Land-Atmosphere Coupling over the U.S. Southern Great Plains. J. Geophys. Res., (Atmospheres), https://doi.org/10.1029/2018JD028463. Zhang, Y., S. Xie, et al., 2018: The ARM cloud radar simulator for global climate models: Bridging field data and climate models. Bull. Amer. Meteor. Soc., 99, 21–26, https://doi.org/10.1175/BAMS-D-16-0258.1. Feldman, D. R., W. D. Collins, S.C. Biraud, M.D. Risser, D.D. Turner, P.J. Gero, S. Xie, E.J. Mlawer, T.R Shippert, L.D. Riihimaki, E.J. Dlugokency, P.C. Novelli, D. Helmig, J. Hueber, M. S. Torn, 2018: First observation of CH4 surface radiative forcing and its thermodynamic dependence, Nature Geoscience. 11, 238-241. DOI:10.1038/s41561-018-0085-9. Ma, H.-Y., S. A. Klein, S. Xie, et al. 2018: CAUSES: On the role of surface energy budget errors to the warm surface air temperature error over the Central U.S. J. Geophys. Res. Atmos., 123, 2888–2909. DOI: 10.1002/2017JD027194. Van Weverberg, K., C. J. Morcrette, J. Petch, S. A. Klein, H.-Y. Ma, C. Zhang, S. Xie, Q. Tang, W. I. Gustafson, Y. Qian, L. K. Berg, M. Wang, Y. Liu, M. Ahlgrimm,R. Forbes, E. Bazile, R. Roehrig, J. Cole, W. Merryfield, W.-S. Lee, F. Cheruy,L. Mellul, Y.-C. Wang, K. Johnson, and M. Khaiyer, 2018: CAUSES: Attribution of surface radiation biases in NWP and climate models near the U.S. Southern Great Plains. J. Geophys. Res. Atmos., 123, 3612–3644. DOI: 10.1002/2017JD027188. Morcrette, C. J., and coauthors including H.-Y. Ma, 2018: Introduction to CAUSES: Near-surface temperature errors in NWP and climate model 5-day hindcasts near the Southern Great Plains. J. Geophys. Res. Atmos., 123, 2655–2683. DOI: 10.1002/2017JD027199. Qin, Y., Y. Lin, S. Xue, H. Ma, and S. Xie, 2018: A diagnostic PDF cloud scheme to improve subtropical low clouds in NCAR Community Atmosphere Model (CAM5), J. Adv. Model. Earth Sys., 10, 320–341. DOI: 10.1002/2017MS001095. Zhang, K., P. J. Rasch, M. A. Taylor, H. Wan, R. Leung, P.-L. Ma, J.-C. Golaz, J. Wolfe, W. Lin, B. Singh, S. Burrows, J.-H. Yoon, H.Wang, Y. Qian, Q. Tang, P. Caldwell, and S. Xie (2018), Impact of numerical choices on water conservation in the E3SM Atmosphere Model version 1 (EAMv1), Geosci. Model Dev., 11(5), 1971–1988, doi:10.5194/gmd-11-1971-2018. Giangrande, S. E., Z. Feng, M. P. Jensen, J. Comstock…, S. Xie, …, 2017: Cloud characteristics, thermodynamic controls and radiative impacts during the Observations and Modeling of the Green Ocean Amazon (GoAmazon2014/5) experiment, Atmos. Chem. Phys., 17, 14519-14541, https://doi.org/10.5194/acp-17-14519-2017. Zhang, Y., S. A. Klein, J. Fan, A. Chundra, P. Kollias, S. Xie and S. Tang, 2017: Large-eddy simulation of shallow cumulus clouds over land: A composite case based on ARM long-term observations at its Southern Great Plains site. J. Atmos. Sci., 74, 3229-3251, DOI: 10.1175/JAS-D-16-0317.1. Tang, S., S. Xie, et al. 2016: Large-Scale Vertical Velocity, Diabatic Heating and Drying Profiles Associated with Seasonal and Diurnal Variations of Convective Systems Observed in the GoAmazon2014/5 Experiment, Atmos. Chem. Phys. Discuss., 2016, 1-39, doi: 10.5194/acp-2016-644. Zhang, M., Somerville, R.C. and Xie, S., 2016. The SCM Concept and Creation of ARM Forcing Datasets. Meteorological Monographs, 57, pp.24-1. DOI: http://dx.doi.org/10.1175/AMSMONOGRAPHS-D-15-0040.1. Tang, S. , M. Zhang, and S. Xie 2015: Ensemble Constrained Variational Analysis of Atmospheric Forcing Data for Process Models and Application to Evaluate Simulated Clouds in CAM. J. Geophys. Res. Atmos., doi: 10.1002/2015JD024167. Ma, H. et al. (including S. Xie) 2015: Evaluation and diagnosis of physical processes in global climate models with an improved hindcast approach. Journal of Advances in Modeling Earth Systems. J. Adv. Model. Earth Syst., 7, 1810–1827, doi:10.1002/2015MS000490. Jensen, M.P., W.A. Petersen, A. Bansemer, N. Bharadwaj, L.D. Carey, D.J. Cecil, S.M. Collis, A.D. Del Genio, B. Dolan, J. Gerlach, S.E. Giangrande, A. Heymsfield, G. Heymsfield, P. Kollias, T.J. Lang, S.W. Nesbitt, A. Neumann, M. Poellot, S.A. Rutledge, M. Schwaller, A. Tokay, C.R. Williams, D.B. Wolff, S. Xie, and E.J. Zipser, 2015: The Midlatitude Continental Convective Clouds Experiment (MC3E). Bull. Amer. Meteorol. Soc., in press, doi:10.1175/BAMS-D-14-00228.1. Muhlbauer, A., T. P. Ackerman, P. R. Lawson, S. Xie, and Y. Zhang, 2015: An observationally-based study case of midlatitude cirrus for cloud-permitting and cloud-resolving models. J. Geophys. Res. Atmos., 120, 6597-6618, doi:10.1002/2014JD022570. Boyle, J. S., Klein, S. A., Lucas, D. D., Ma, H. -Y. ., Tannahill, J. and Xie, S. (2015), The parametric sensitivity of CAM5’s MJO. J. Geophys. Res. Atmos., 120: 1424–1444. doi: 10.1002/2014JD022507. Vogelmann, A. M., A. M. Fridlind, T. Toto, S. Endo, W. Lin, J. Wang, S. Feng, Y. Zhang, D. D. Turner, Y. Liu, Z. Li, S. Xie, A. S. Ackerman, M. Zhang, and M. Khairoutdinov (2015), RACORO continental boundary layer cloud investigations: 1. Case study development and ensemble large-scale forcings. J. Geophys. Res. Atmos., 120, 5962–5992. doi: 10.1002/2014JD022713. Jensen, M. P., Toto, T., Troyan, D., Ciesielski, P. E., Holdridge, D., Kyrouac, J., Schatz, J., Zhang, Y., and Xie, S.: The Midlatitude Continental Convective Clouds Experiment (MC3E) sounding network: operations, processing and analysis, Atmos. Meas. Tech., 8, 421-434, doi:10.5194/amt-8-421-2015, 2015. Ma, H., S. Xie, S. Klein, et al. 2014: On the Correspondence between Mean Forecast Errors and Climate Errors in CMIP5 Models. J. Climate. 27, 1781-1798. doi: 10.1175/JCLI-D-13-00474.1. Zhao, C., S. Xie, X. Chen, M. Jensen, and M. Dunn, 2014: Quantifying uncertainties of cloud microphysical property retrievals with a perturbation method. J. Geophys. Res. Atmos., 119, 5375–5385, doi:10.1002/2013JD021112. Petch, J., A. Hill, L. Davis, A. Fridlind, C. Jakob, Y. Lin, S. Xie, and P. Zhu, 2014: Evaluation of intercomparison of four different types of model simulating TWP-ICE, Q. J. R. Meteorol. Soc., 140, 826-837, DOI: 10.1002/qj.2192. Ma, H., S. Xie, J. Boyle, S. Klein, and Y. Zhang, 2013: Development of Metrics and Diagnostics for CAM Climate Model Short-range Forecasts. J. Climate. 26, 1516-1534. doi: 10.1175/JCLI-D-12-00235.1. Lin, Y., M. Zhao, Y. Ming, J-C. Golaz, L. J. Donner, S. A. Klein, V. Ramaswamy, and S. Xie, 2013: Precipitation partitioning, tropical clouds and intraseasonal variability in GFDL AM2. J. Clim. , 26, 5453–5466. doi: 10.1175/JCLI-D-12-00442.1. Davies, L., et al. (including S. Xie), 2013: A Single Column Model Ensemble approach applied the TWP-ICE experiment. J. Geophys. Res., 118, 6544-6563, doi:10.1002/jgrd.50450. Davies, L. C. Jakob, V. Kumar, P. May and S. Xie, 2013: Relationships between the large-scale atmosphere and the small-scale state for Darwin, Australia. J. Geophys. Res., accepted. DOI: 10.1002/jgrd.50645. Zhang, Y., S. Xie, C. Covey, D. D. Lucas, P. Gleckler, S. Klein, J. Tannahill, C. Doutriaux,and R. Klein, 2012: Regional assessment of the parameter-dependent performance of CAM4 in simulating tropical clouds. Geophys. Res. Lett., 39, L14708, doi:10.1029/2012GL052184. Qian Y, CN Long, H Wang, JM Comstock, SA McFarlane, and S Xie. 2012: Evaluation of Cloud Fraction and Its Radiative Effect Simulated by IPCC AR4 Global Models Against ARM Surface Observations, Atmos. Chem. Phys., 12, 1785-1810. DOI:10.5194/acp-12-1785-2012. Zhao, C., S. A. Klein, S. Xie, X. Liu, J. S. Boyle, and Y. Zhang, 2012: Aerosol First Indirect effects on non-precipitating low-level liquid cloud properties as simulated by CAM5 at ARM sites, Geophys. Res. Lett., 39, L08806, doi:10.1029/2012GL051213. Fridlind, A., et al. (including S. Xie), 2012: A Cloud-Resolving Model Intercomparison Based on the Tropical Warm Pool–International Cloud Experiment, Part I: Specification and Results versus Domain-Wide Observations. J. Geophys. Res., 117, D05204 DOI: 10.1029/2011JD016595. Zhao, C. S. Xie, S. Klein, et al., 2012: Toward Understanding of Differences in Current Cloud Retrievals of ARM Ground-based Measurements. J. Geophys. Res., 117, D10206, DOI: 10.1029/2011JD016792. Huang, D., C. Zhao, M. Dunn, X. Dong, G. G. Mace, M. P. Jensen, S. Xie, and Y. Liu, 2012: An intercomparison of radar-based liquid cloud microphysics retrievals and implication for model evaluation studies. Atmos. Meas. Tech., 5, 1409-1424 DOI: 10.5194/amt-5-1409-2012. Lin, Y., L. J. Donner, J. Petch, P. Bechtold, J. Boyle, S. A. Klein, T. Komori, K. Wapler, M. Willett, X. Xie, M. Zhao, S. Xie, S. A. MaFarlane, C. Schumacher, 2012: TWP-ICE global atmospheric model intercomparison: Convection responsiveness and resolution impact. J. Geophys. Res., 117, D09111, doi: 10.1029/2011JD017018. Chuang, C. C., J. Kelly, J. Boyle, and S. Xie, 2012: Sensitivity of Aerosol Indirect Effects to Cloud Nucleation and Autoconversion Parameterizations in Short-Range Weather Forecasts over the Southern Great Plains During May 2003 IOP. Journal of Advances in Modeling Earth Systems, DOI: 10.1029/2012MS000161. Liu, X., S. Xie, J. Boyle, S. A. Klein, X. Shi, Z. Wang, W. Lin, S. J. Ghan, M. Earle, P. S. K. Liu, and A. Zelenyuk1, 2011: Testing Cloud Microphysics Parameterizations in NCAR CAM5 with ISDAC and M-PACE Observations. J. Geophys. Res., 116, D00T11, doi:10.1029/2011JD015889. Zeng, X., W. Tao, T. Matsui, S. Xie, S. Lang, M. Zhang, D. Starr, and X. Li 2011: Estimating the ice crystal enhancement factor in the tropics. J. Atmos. Sci. 68, 1424-1434. McFarquhar, G., S. Ghan, et al. (including S. Xie), 2011: Indirect and Semi-Direct Aerosol Campaign (ISDAC): The Impact of Arctic Aerosols on Clouds, Bull. Amer. Meteor.,doi: 10.1175/2010BAMS2935.1. Kennedy, A., X. Dong, B. Xi, S. Xie, Y. Zhang, and J. Chen, 2011: A Comparison of MERRA and NARR Reanalysis Datasets with the DOE ARM SGP Continuous Forcing data. J. climate, 24 4541-4557 DOI: 10.1175/2011JCLI3978.1. Woolnough, S. J., P. N. Blossey, K .- M. Xu, P. Bechtold, J.-P. Chaboureau, T. Hosomi, S.F. Iacobellis, Y. Luo, J. C. Petch, R. Y. Wong, and S. Xie, 2010: Modeling convective processes during the suppressed phase of a Madden-Julian Oscillation: Comparing single-column models with cloud-resolving models. Q. J. R. Meteorol. Soc. ,136 , 333-353, DOI:10.1002/qj.568. Wang, W., X. Liu, S. Xie, J. Boyle, and S. McFarlane, 2009: Testing ice microphysics parameterizations in NCAR CAM3 using TWP-ICE data, J. Geophys. Res., 114, D14107, doi:10.1029/2008JD011220 . Zeng, X., W. Tao, M.Zhang, A. Hou, S. Xie, S. Lang, X. li, D. Starr, and X. Li, 2009: A contribution by ice neclei to global warming. Q. J. R. Meteorol. Soc., 135, 1614-1629. DOI:10.1002/qj.449 . Klein et al. (including S. Xie) 2009: Intercomparison of model simulations of mixed-phase clouds observed during the ARM Mixed-Phase Arctic Cloud Experiment. Part I: Single layer cloud, Q. J. R. Meteorol. Soc., . Soc., 135: 979-1002. DOI:10.1002/qi.416 . Marrison etal. (including S. Xie) 2009: Intercomparison of model simulations of mixed-phase clouds observed during the ARM Mixed-Phase Arctic Cloud Experiment. Part II: Multi-layered cloud, Q. J. R. Meteorol. Soc., 135: doi :10.1002 /qj.415. Guo, H., J. Penner, M. Herzog, and S. Xie, 2007: In vestigation of the first and second aerosol indirect effects on clouds during the May 2003 ARM intensive operational period at Southern Great Plains. J. Geophys. Res. 112, D15206, doi:10.1029/2006JD007173 . Liu, X., S. Xie, and S. J. Ghan, 2007: Evaluation of a new mixed-Phase cloud microphysics parameterization with the NCAR single column climate model (SCAM) and ARM M-PACE observations, Geophysical Research Letter, 34, L23712, doi:10.1029/2007GL031446 . Xu, K.-M., M. H. Zhang , …, S. Xie et al., 2005:. Modeling springtime shallow and deep frontal clouds with CRMs and SCMs. J. Geophys. Res., 110, D15S04, doi:10.1029/2004JD005153 . Boyle, J. S., et al., and S. Xie, 2005: Diagnosis of CAM2 in NWP configuration. J. Geophys. Res., 110 doi:10.1029/2004JD005042 . Williamson, D. L., et al., and S. Xie, 2005: Moisture and temperature budgets at the ARM SGP site in forecasts with CAM2. J. Geophys. Res., 110 doi:10.1029/2004JD005109 . Zhang, M. H., W. Y. Lin, et al, and S. Xie, 2005: Comparing clouds and their variations in 10 atmospheric general circulation models with satellite measurements. J. Geophys. Res., 110 doi:10.1029/2004JD005021 . Tu, W., S. C. Xie, and W. Chen, 1995: Experiments of the NMC (Beijing) T63 Four-Dimensional Data Assimilation Operational System. Quart. J. of Applied Meteorology, Vol. 6, 199-205. Shen, Y., X. Ding, and S. Xie, 1994: Analysis increment vertical interpolation scheme in T63 data assimilation and its experiments. Quart. J. of Applied Meteorology, Vol. 4. Tian Y., and S. C. Xie, 1987: Test of Explicit Integration Schemes for the Barotropic Primitive Equation Model. Journal of Nanjing Institute of Meteorology, Vol.10, 95-102. Xie, S. D. Neelin, P. Bechtold, H. Ma, 2018: Improving the simulation of diurnal and sub-diurnal precipitation over different climate regimes. White paper to the Global Atmospheric System Studies (GASS) Panel. Riihimaki, L., including S. Xie, 2018: Translator Plan: A Coordinated Vision for Fiscal Years 2018-2020. https://www.arm.gov/publications/programdocs/doe-sc-arm-17-039.pdf. Zhang C and S Xie. 2017. ARM Data-Oriented Metrics and Diagnostics Package for Climate Model Evaluation Value-Added Product. Ed. by Robert Stafford, ARM Climate Research Facility. DOE/SC-ARM-TR-202. Zhang Y and S Xie. 2017. ARM Cloud Radar Simulator Package for Global Climate Models Value-Added Product.Ed. by Robert Stafford, ARM Climate Research Facility. DOE/SC-ARM-TR-190. DOE Workshop Report on “ACME/ASR/ARM Coordination Workshop”, Oct. 21-22, 2016, Washington D. C., USA. DOE BER Documentation. http://science.energy.gov/~/media/ber/pdf/workshop%20reports/CESD_ACME_ARM_ASR_workshopreport_web.pdf (workshop co-Chair, one of the lead authors). Contributed to the Atmospheric Radiation Measurement Climate Research Facility Data Decadal Vision. DOE ARM documentation, in preparation, 2015. DOE Workshop Report on “ACME/ASR/ARM coordination meeting”, Oct. 21-22, 2015, Washington D. C., USA. DOE BER Documentation, in preparation, (workshop co-Chair). DOE Workshop Report on “DOE Data and Informatics Workshop”, August 13-15, 2015, Washington D. C., USA. DOE BER Documentation., in preparation, (workshop participant). DOE Workshop Report on “The DOE High-Resolution Modeling Workshop”, May 19-20, 2014, Washington D. C., USA. DOE BER Documentation. (workshop participant). DOE Workshop Report on “The DOE ARM North Slope of Alaska Supersite Workshop”, Sept. 10-11, 2014, Washington D. C., USA. DOE BER Documentation. (workshop participant). Contributed to the Atmospheric Radiation Measurement Climate Research Facility Decadal Vision. DOE ARM documentation, http://www.arm.gov/publications/programdocs/doe-sc-arm-14-029.pdf, 2014. Haeffelin M. and S. Xie. 2013: US-EU Data-Harmonization Working Group Whitepaper for “Atmospheric Research Observatory Data Re-Analysis for GCM and LES Initialization and Evaluation and Climate Studies”. DOE ARM documentation. DOE Workshop Report on “Climate Change Challenges and Observations”, November 2012, Washington D. C., USA. DOE BER Documentation. (workshop participant). DOE Workshop Report on “Community Modeling and Long-Term Predictions of the Integrated Water Cycle”, September 2012, Washington D. C., USA. DOE BER Documentation. (workshop participant). Xie, S., et al. 2011: The whitepaper for “Quantification of Uncertainty in Cloud Retrievals (QUICR)”. DOE ARM documentation. Xie, S., et al. 2011: Guidance for Modification and Reprocessing of ARM Datastreams. DOE ARM documentation.